Quality Remodeling OK and it's handyman services can solve all your outdoor handyman needs in one phone call. From mending chain link or wood fences, A/C unit fence surrounds, new fence installs, fence pole breaks, deck repairs, gutter cleaning, power washing exterior of your home, and much more. We have seasonal upkeep checklists to keep up with you annual home maintenance. A lot of work goes into keeping your deck maintained. Staining, power-washing, water-resistant treatments, and deck repairs. These are all important maintenance items for sustaining home value. QROK specializes in all deck maintenance. We repair decks damaged by water, bugs, and general wear and tear in just one call. In one visit we can repair damaged boards, tighten loosened screws while performing common deck maintenance such as staining. When decks are beyond repair we will give recommendations on replacement. When this is the case, we promise to give you a fair estimate you can trust. remember, we pride ourselves on two words; Quality and Affordable! Many surface repairs are easily made to resore your deck to its former glory. Structural deck repair however may indicate its time for a new deck installation. Let David and QROK help you decide your options for a new deck installation or a deck repair. 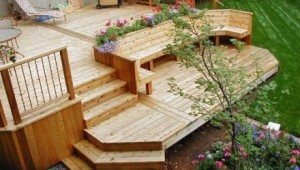 Let us help you with your outdoor deck repairs/restorations at your home. Please call us now at 405-340-8526 or email David at DavidT@QualityRemodelingOK.com.